Millennial women view the time they spend with digital content as their "me time," and they use content as a way to turn inspiration into action, emotionally connecting with topics they find entertaining, informative, and inspiring. Millennial women take action by engaging with content, sharing content with their friends and family, or putting the information to use in their day-to-day lives. As part of the POPSUGAR Future of Retail Experiences study, we asked women to tell us the types of content they find valuable and would like to see more of and the content that they'd like to see less of when it comes to fashion and style. Overall, millennial women seek more content that will help them do more. 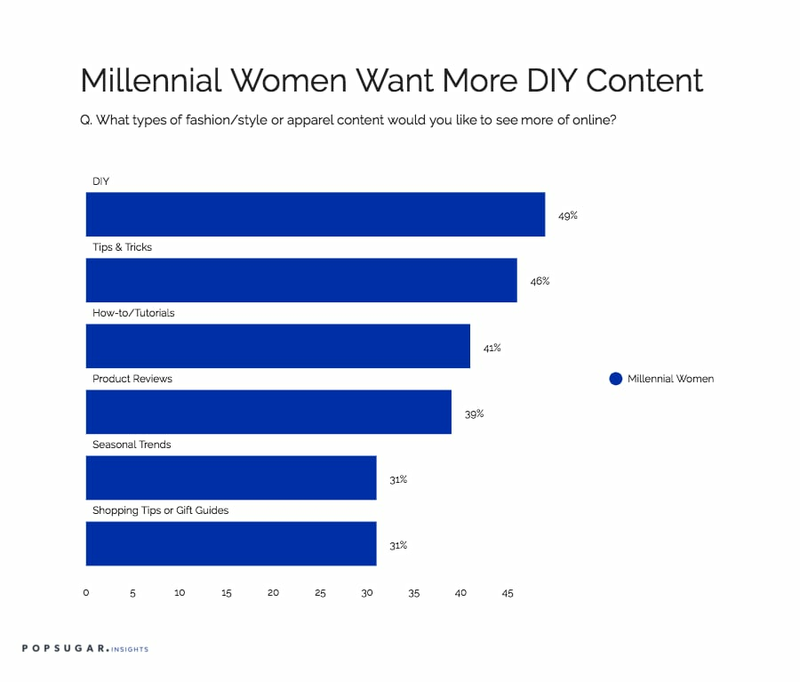 Nearly one half of millennial women want to see more DIY content (49%) and 46% want to see more tips and tricks when it comes to finding deals or tapping into a popular style. Over four in 10 millennial women want to see more tutorials (41%), perhaps showing them how to find the right outfit or how to achieve a certain look for an upcoming event. Thirty-nine percent of millennial women want to see more product reviews, and 31% want more content that connects them to seasonal trends, such as gift guides, making it easy for them to find and purchase great gifts for their friends and family. Compared to women overall, millennial women are 23% more likely to want more DIY content and 15% more likely to want to see more tips and tricks. Based on the results of our study, there are only a few types of fashion and style content women want to see less of. Overall, less than one in five millennial women say that they'd like to see less live event coverage and the same percentage say they'd like to see less branded content. It's important for brands to remember to create content for the end user's benefit, and finding the proper balance of delivering valuable information alongside a brand message can be difficult for some content creators, as it's not their core competency. For live event coverage, recent industry developments like the emergence of Facebook Live may provide publishers and brands with new and innovative way to cover live events in a way that will resonate with millennial women.